Outback Fibers imports fabulous Margilan silk gauze from Uzbekistan. We call it Butterfly Silk. 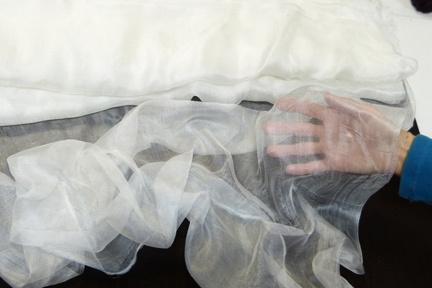 When you handle this silk, you are reminded of the gossamer wings of a butterfly--so delicate and almost transparent. It will add a new dimension to your nuno felting. Gossamer, open-weave silk gauze with the look of a fine, lightweight cheesecloth, but with the wonderful luster of a habotai silk. Perfect for nuno felting in many applications. I think this is the type of fabric featured in the video by Diana Nagorna....and wouldn't we all love to have that dress?? We offer the Butterfly Silk in three weights. We are unable to determine an equivalent momme count for this silk as it is quite different from the standard Chinese silk fabrics on the market. We have taken photographs in an effort to convey the sheer nature of the fabrics. The three weights of fabric are all different widths, so please note that when purchasing below. The Gossamer silk is best used as a method of trapping surface design elements that might otherwise not attach themselves to the base fibers. Due to its delicate weave, this weight comes with some inherent flaws that occur during the weaving process, but these usually disappear into the felt once it is fulled. It is subject to snagging, so handle with care. 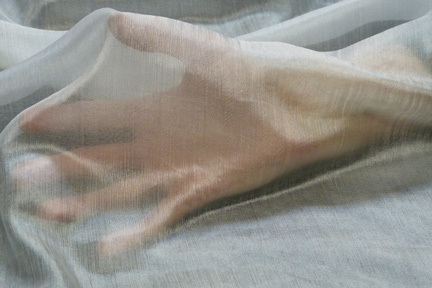 This silk is known as Margilan Rarified Silk Gauze. The Featherweight silk is a slightly tighter weave, but still lacks enough substance to stand alone as a base fabric. Wonderful to use scrunched up for surface interest and since less wool will penetrate, there will be more texture created during fulling. This silk is known as Margilan Silk Gauze. We have all the fibers and fabrics you need to make fabulous garments and accessories. 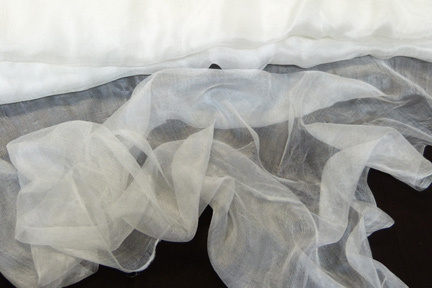 Outback Fibers also sells dyed Habotai and Silk Gauze / Tissue silk fabric and dyed open weave Silk Mesh fabric to coordinate with our superfine space dyed merino. Our fabrics allow you to produce incredible results for your Nuno felting projects. These fabrics are perfect for your very own unique, one-of-a-kind piece of nuno felt sure to attract attention and interest.